During the course of a season that has seen the Titans win just two of 10 games, there has been plenty of ‘what if’ moments, and Monday night in their latest loss, a 27-24 loss to Pittsburgh, there was a number of those key moments. The club had an 11-point lead late in the third quarter, yet couldn’t keep the heat on Steelers QB Ben Roethlisberger, and also couldn’t slow down running back Le’Veon Bell, who ran all over the Titans for 204 yards on 33 carries, 6.2 yards per carry. While the defense couldn’t put the clamps on the Steelers after going up 11, the offense basically shut down, running just seven plays the entire fourth quarter, gaining just 20 yards and one first down. The defense got to Roethlisberger five times, but getting to him in the final 18 minutes was tough, as he was 6-for-9 for 67 yards in the two touchdown drives and final drive in which they ran the clock out. Bell dominated the Titans, running up the middle just about the whole night, gashing Tennessee for 7, 8, 9 yards at a time. In that final drive the Steelers, up three points, ran out the final 6:58 with Bell going through gaping holes helped out by an offensive line coached by former Titans coach Mike Munchak. Zach Mettenberger was 15-for-24 for 263 yards with two touchdowns and a pick, the interception on his first pass of the game, a pick six by Steelers CB William Gay. The Titans though down early 10-0 rallied for a touchdown on a nifty drive capped by a run by Bishop Sankey from 9 yards out as he broke at least four tackles. Down 13-10, the Titans turned the game in their favor as Jason McCourty picked off Roethlisberger in the end zone with less than a minute left in the half. Instead of going in the locker room down 13-10, the Titans went for the kill, and rookie Mettenberger found former Steeler Nate Washington for an 80-yard touchdown after he pulled a double move on Gay. The turnaround made it 17-13 Titans, and they built the lead to 24-13 in the third quarter after they drove 77 yards, the final four coming on a Mettenberger to tight end Chase Coffman score. 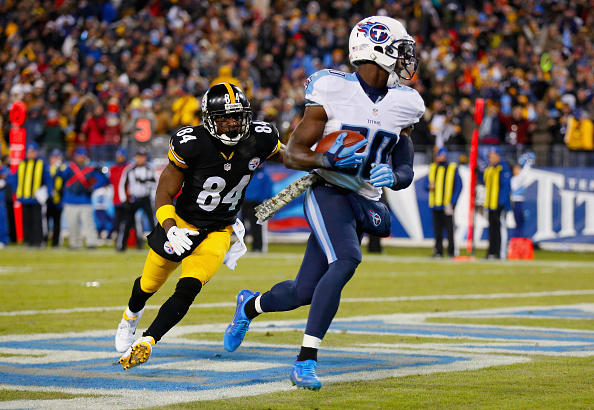 While it looked like things were well in order for the Titans, they couldn’t hold the lead, as the Steelers rallied for two touchdowns in the final quarter to take home the win. The final score for the Steelers came when Roethlisberger drove the team 65 yards and hit Antonio Brown for a 12-yards TD with 9:07 to play. By then, the Titans offense was in stall mode, and their final drive ended on the Steelers 48 after Mettenberger hit Derek Hagan for 5 yards, but it was 3 yards short of a first down. With one time out and still nearly 7 minutes left, Ken Whisenhunt punted, which was the right move, but it backfired as the Steelers moved their way down the field with Bell punching out yards to save their lead and put the game away. Now at 2-8, the Titans have lost four straight, and will play at the Eagles in Philadelphia Sunday. Don’t you wish you could send this team back to Houston? At least the Vols are starting to play well again and bring decent football back to the state of Tennessee. You can take the Oilers out of Houston, but you will never take the Oilers out of the Titans!